I really, really hate ticks. 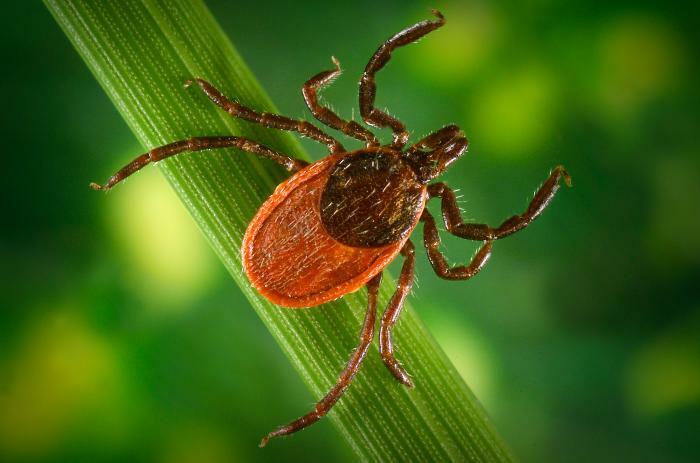 Here in Rhode Island, there are several species of ticks, the best known of which is probably the nasty little black legged, or deer tick, that transmits Lyme Disease. June, the most dangerous time of year, will soon be upon us, when the deer tick nymphs emerge, hungry for our blood. These little buggers are the size of poppy seeds, so how the heck can to be sure you don’t have one in your hair? Or somewhere else, like your ear? I am also worried about the other serious diseases ticks transmit: babesiosis, which attacks the red blood cells and anaplasmosis, which attacks the white blood cells. I recently spoke with a man, a person who, like me, spends time in the woods, and he contracted Lyme, Babesiosis and Anaplasmosis AT THE SAME TIME from a nymphal tick he never saw. He nearly died. I refuse to stay indoors during the summer, but between my gardening and hiking, I worry that it’s inevitable that I will catch something. I do apply a permethrin spray, made by Sawyer, that you use on your clothes and is good for several washings. I also tuck my pants into my socks when I garden or hike. But I can’t do all that every time I walk my dog, or run out to get the mail. Yes, the dog is protected. I’d rather not have to put anything on her, but at this time of year, after pulling so many ticks off her, I finally threw in the towel. The University of Rhode Island’s “TickEncounter” website is THE source of information on all things tick, including which ones are biting where and in what month. It’s a terrific resource for anyone who might have to deal with these nasty parasites. Anyway, please be very careful, my gardening friends. The ticks are out there, and they can make you very sick indeed. Thanks, dn. It’s certainly time to start being careful. I hate those little buggers. Yup, the dry weather seems to have been keeping them at bay a bit, but I pulled my first deer tick of the season off me yesterday. Now I make a note to myself to keep an eye on the spot. Right now it is an itchy red bump, which is not a problem. If in two or three weeks it returns as a non-itchy, non-raised red mark, or if I come down with extreme tiredness around that time, I’ll visit the doctor for a regimen of antibiotics. I don’t bother with the blood test any more. I’ve caught Lyme three or four times, but each time knocked it away. I can’t keep out of the weeds. Yuck! I went for a walk this morning ON THE ROAD and when I got home, I found one crawling up my leg. These little buggers are one of the reasons I adore wild turkeys! I haven’t found a tick on my wooded 2 acres near the Great Swamp in years, and I credit it to my “herd” of wild turkeys that eat them like popcorn. Next to cracked corn, I think ticks are their favorite food. I have heard that about wild turkeys. I think chickens and guinea fowl love to eat them too. Too bad dogs don’t!